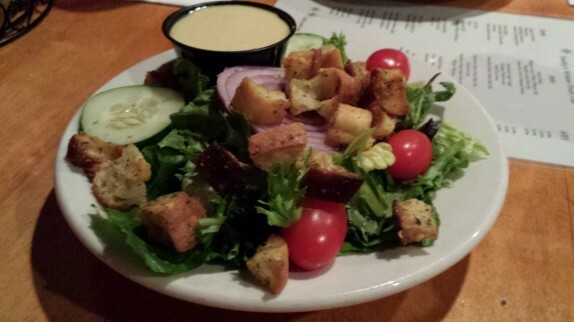 Sometimes you just want to throw eating healthy out the window. One night, we were out in Delmar, and that’s exactly what I wanted to do. The dining room was packed on a weeknight, which was great. Cassie and I ordered up a couple of appetizers, a salad, and something that takes the concept of throwing eating healthy out the window and adds hand grenades to the mix. We’ll get there, though. The menu is very extensive, almost as much as a diner. They offer finger foods, sandwiches, wraps, burgers, pizza, and other plated entrees. To start, Cassie wanted to try their Buffalo chicken dip (with Irish chips) ($9). 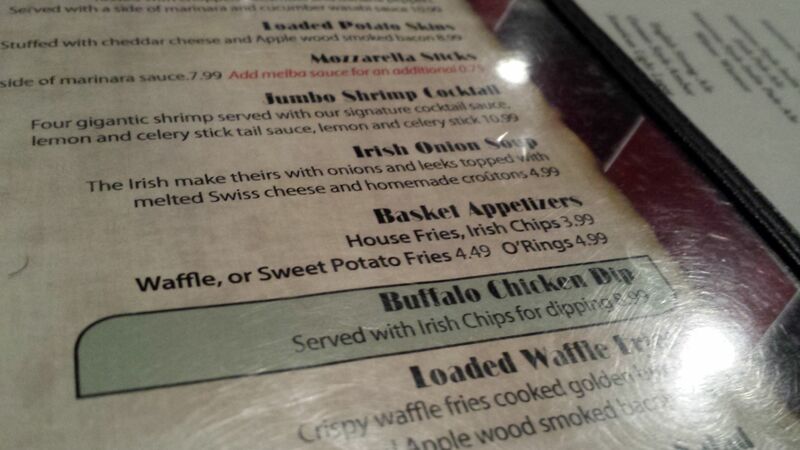 I went for the simple pub favorite, onion rings. The portion of Buffalo chicken dip was massive. The chips were crispy and relatively thick, like a Saratoga chip, if you’re familiar. 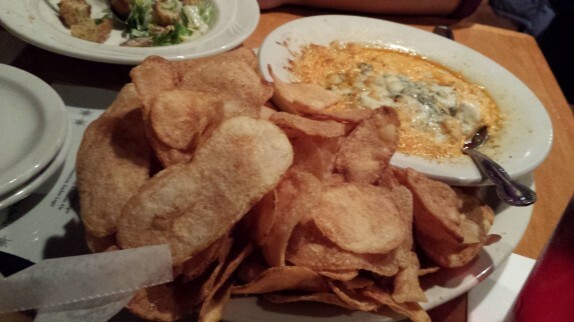 The dip was cheesy and had very strong and assertive Buffalo and blue cheese flavors. It was also very warm, and warm is great when you’re coming in from the cold. 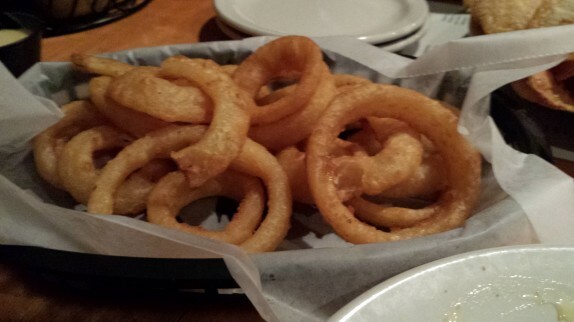 The onion rings were fairly standard. I can’t recall the price, but I thought it was very fair considering the size of the portion. 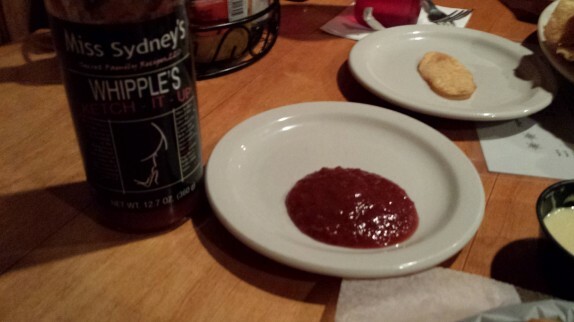 I found some Miss Sydney’s ketchup at the table (which I’ve never had before), and I used that to dip my onion rings. It was chunky as most off brand ketchup is, and it had a bit more flavor. 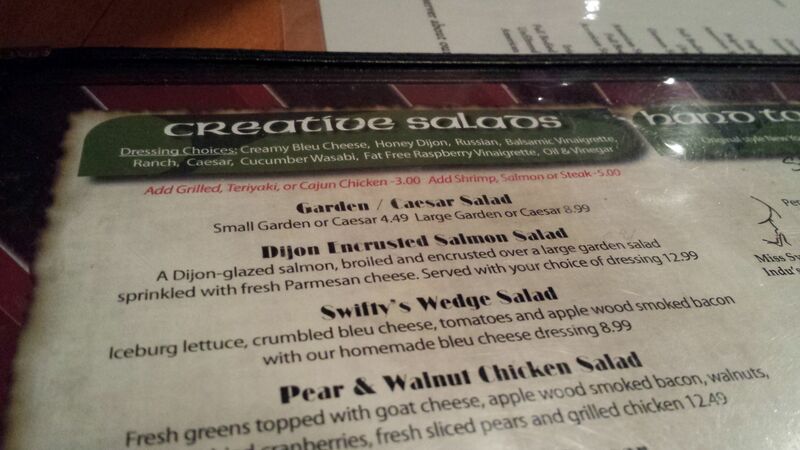 I also had a small garden salad with honey mustard ($5). 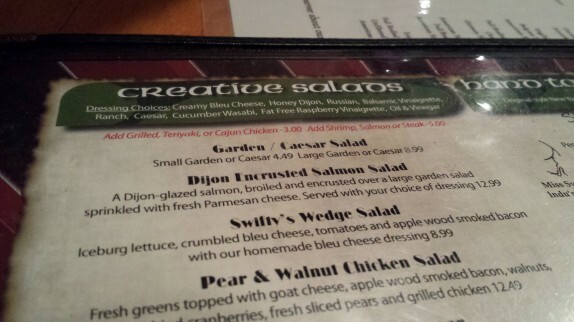 Again, the portion was very modest for the price. 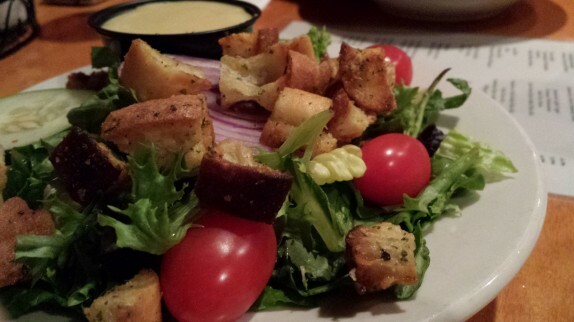 I most enjoyed the homemade croutons. There was way too much honey mustard served along side, but that’s why you always keep some extra onion rings handy. My main course was as indulgent a dish as you’ll find around. 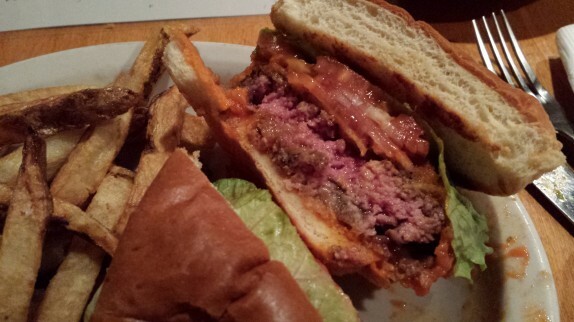 So these guys grill up a giant burger to temperature, batter and fry it, then roll it in homemade Buffalo sauce. They serve that up along side homemade pub-style fries, and give you homemade blue cheese to dip it in. All for $11. I ordered my burger medium-rare and as hot as the sauce comes. 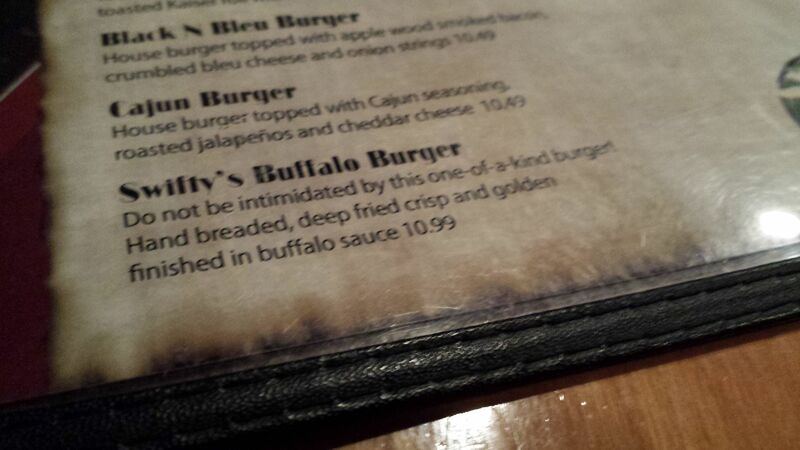 I was absolutely shocked that after being deep fried, the burger came out at that doneness. I was also shocked by the heat level in the hot sauce; usually, I find that hot isn’t all that hot. In this case, it almost made me feel sorry for ordering it that way; I loved it though. The batter on the burger is very light and airy, almost like fish from fish and chips, and it’s rolled in just enough hot sauce that the integrity of the crispiness is still there. This was one of those meals where I savored every amazing, gluttonous bite. It was incredible. For all we ordered (Cassie had a sandwich), our bill came to less than $50, and with such an experience, it’s no wonder the dining room was packed with families and groups of all ages. 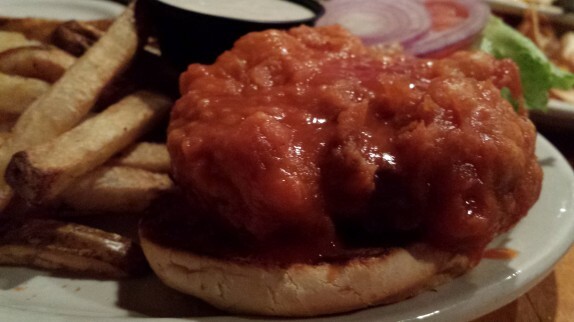 awesome review…I want a Buffalo Burger! 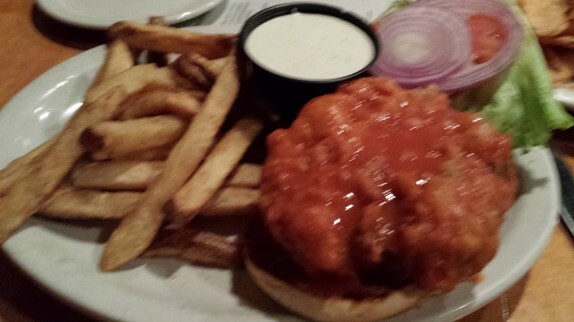 Having ordered the Buffalo chicken burger more than once, I can tell you that no matter what temperature you order it, (I’ve ordreed it medium, which is my go too, and medium well, which is what I ordered when medium came out medium rare) and it comes out looking just like yours, medium rare. That being said, I have enjoyed that burger as an indulgence. I don’t mind rare meat, but my lovely spouse thinks that is “raw” so if you are sensitive to temperature, that should be kept in mind. 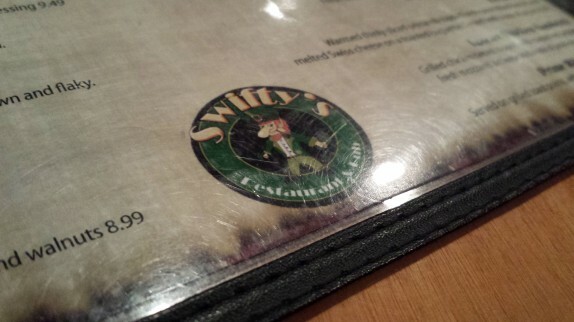 I do love going to Swifty’s.. they are straight up, no frills, bar food. Also, the eggplant wrap is good and the Jack Burger, although swimming in sweet sauce, is one of my favorites. I drive by that place on the way home from work, and it never fails to be hoppin’. Especially in the nice weather, then the outside seating is open.